The Carbon Fibre Hoof Support Patch (HSP), which was developed and patented by RVC farrier, Peter Day, and the RVC�s locomotor research group two years ago, has given a new lease of life to a flat-footed event horse. The HSP is a simple and affordable way to support and treat collapsed heels. 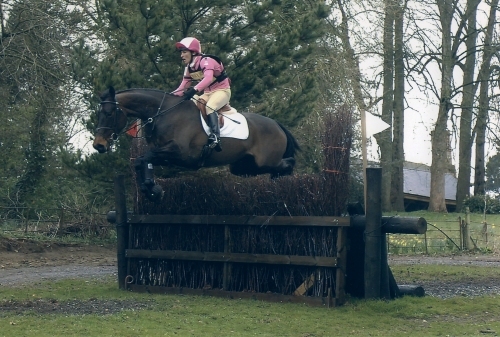 Millie Tonks, competitor and British Eventing accredited trainer, was concerned when her seven-year-old thoroughbred x warmblood pre-novice event mare became short-striding and uncomfortable when the ground became firmer during the early part of last year�s eventing season. The mare had previously suffered with collapsed heels and an intermittent lameness but X-Rays had not revealed any specific problems. The HSP is a clever carbon fibre/resin composite sheet which is applied by the farrier to the hoof wall. It increases the bending strength of the hoof wall by up to 40%, allowing the tubules within the heel to retain their strength, rather than collapsing, as the hoof grows. This in turn helps to prevent deformation of the foot and thereby helps to maintain soundness. Collapsed or under-run heels are one of the most important and common foot abnormalities faced by owners and trainers. The prevalence is so high in thoroughbreds (reportedly affecting between 52% and 97%) that it can lull individuals into thinking that the condition is a normal hoof variation rather than a serious pathological deviation. The collapse of the heel is believed to contribute to many foot-related problems such as navicular syndrome, chronic heel pain (bruising), coffin joint synovitis, quarter cracks, heel cracks, and interference problems. Despite its prevalence the condition is notoriously difficult to prevent or treat.